When does international law give a group the right to choose its sovereignty? In an original perspective on this familiar question, Knop analyzes the ways that many of the groups that the right of self-determination most affects--including colonies, ethnic nations, indigenous peoples and women--have been marginalized in its interpretation. Her analysis also reveals that key cases have grappled with this problem of diversity. Challenges by marginalized groups to the culture or gender biases of international law emerge as integral to the cases, as do attempts to meet these challenges. Part I. Cold War International Legal Literature: 1. The question of norm-type; 2. Interpretation and identity; 3. Pandemonium, interpretation and participation; Part II. Self-determination interpreted in practice: the challenge of culture: 4. The canon of self-determination; 5. Developing texts; Part III. Self-Determination Interpreted in Practice: The Challenge of Gender: 6. Women and self-determination in Europe after World War I; 7. 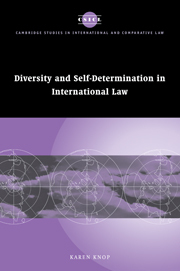 Women and self-determination in United Nations trust territories; 8. Indigenous women and self-determination; Conclusion.